Habemus Papam, one of the most famous Latin phrases still in use today, means “We have a Pope!” It will be said preceding the announcement of which bishop is to be elevated to the office of supreme pontiff. But this ceremony follows a great deal of ritual surrounding the election of a new pope by the group of electors from the College of Cardinals. For a thorough description of the process, see “Election of new pope follows detailed procedure,” a Catholic News Service story. Another resource, Origins, is the documentary service publication from the Catholic News Service organization. 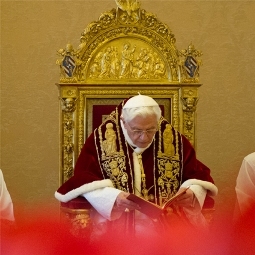 The Feb. 21 issue of Origins has “Reactions to Pope Benedict XVI’s Resignation” by various religious and civic leaders, as well as an English translation of the statement of resignation by Pope Benedict XVI. Origins is a digest of official and authoritative sources of information, including speeches and statements on matters related to the Catholic Church. Recent issues of Origins have been placed on reserve in the Library, so you need to ask for them at the circulation desk. There is an online archive of Origins to which Falvey subscribes, too. The Journal Finder is the best way to determine if Falvey provides access to content from periodicals either in print or online, or both. Darren Poley is the theology and religious studies subject librarian. Contact him directly at darren.poley@villanova.edu.